The ferns are in the full sun for most of the day beween May and September, but also in the only spot in the garden that gets watered by rainwater from the roof (of which there has been very little! ), which is directed down through a pipe under the rockery. After the heat of July and August they were badly singed, and brown and had flopped completely. …but then new shoots began appearing and after just three weeks they are about 2 or 3 feet high! This was the first time I had to cut them back so early, so I had no idea they regenerate so effectively in the summer. Have you had any nice gardening surprises recently? This entry was posted in Garden, Nature, Plants and tagged Garden, Nature, Plants, Seasons, Summer. Bookmark the permalink. Your garden is so lovely! I had a similar experience with my maidenhair ferns. They were accidentally cut down completely with a mower by my poor husband. I almost died. But within a few weeks they were back full force! I think ferns are pretty indestructible! Thanks for your comment – interesting to hear someone’s had a similar experience! Absolutely beautiful light. I’ve tried to take pictures before when the light plays so beautifully on the garden, and it isn’t always possible to capture it. You really did! 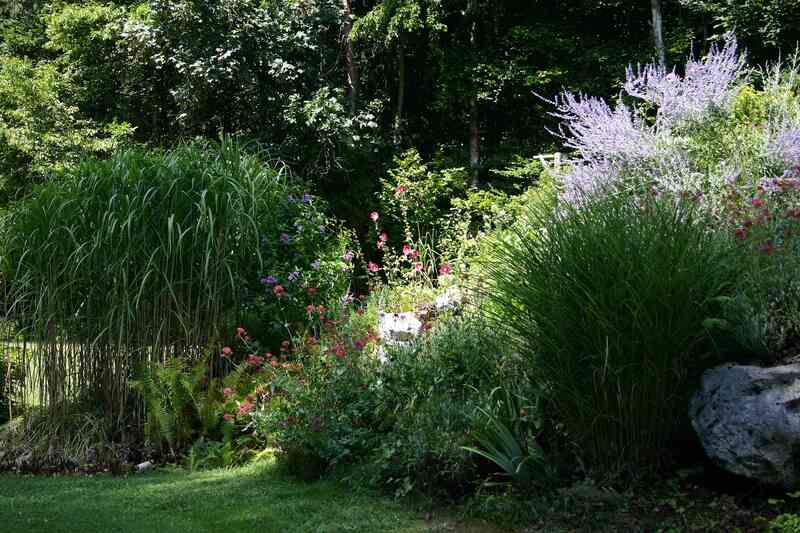 I can’t say it often enough, Cathy, your garden is just incredibly beautiful and inviting! Yup. Gorgeous. Just tell me where to put my deckchair! Anywhere you like, but under the maple is nice as the leaves are starting to turn red, and looking up against the blue sky is so relaxing! Yes, I’m constantly surprised at how the garden has survived, although my aster buds look very small still. Thank you Elisabeth! 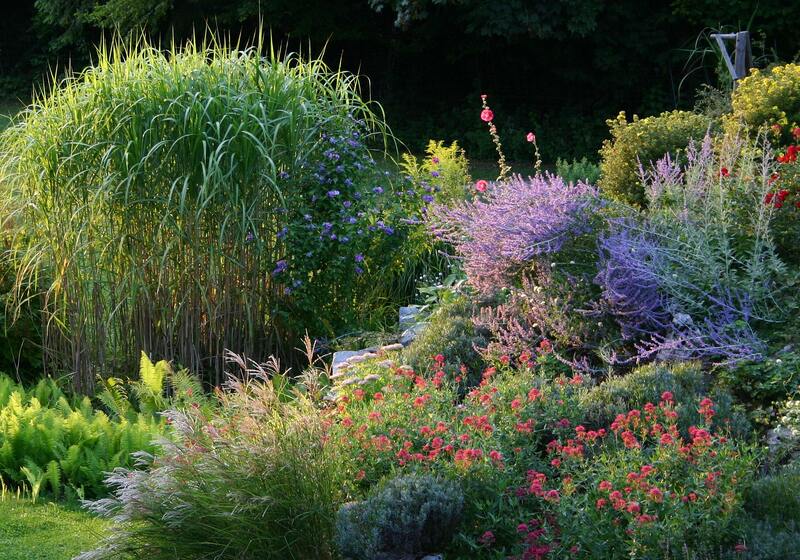 Your rockery is looking so beautiful in the evening light, the Perovskia just glows! 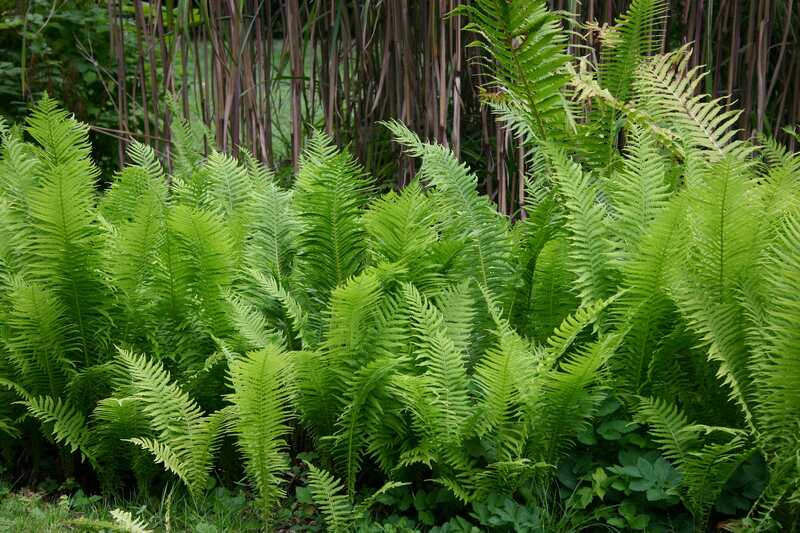 Interesting to hear about your ferns, I’ve never tried that but will in future. Beautiful images, Cathy – magic of the light :). I’ve had many surprises, a lot of nice ones too but now I hope for rain before my biceps look like those of Arnold Schwarzenegger and my garden like the desert. Best wishes! We need rain too Annette… I want to start planting bulbs soon and can’t even get a trowel in the ground in some spots it’s so dry! same here 😦 , so you have loamy soil too? And the ferns spread too if you’re not vigilant… I’m always digging out more! The sun is moving round fast so we must make the most of the evening light while it’s still there. Stunning! Love seeing your garden from this viewpoint. 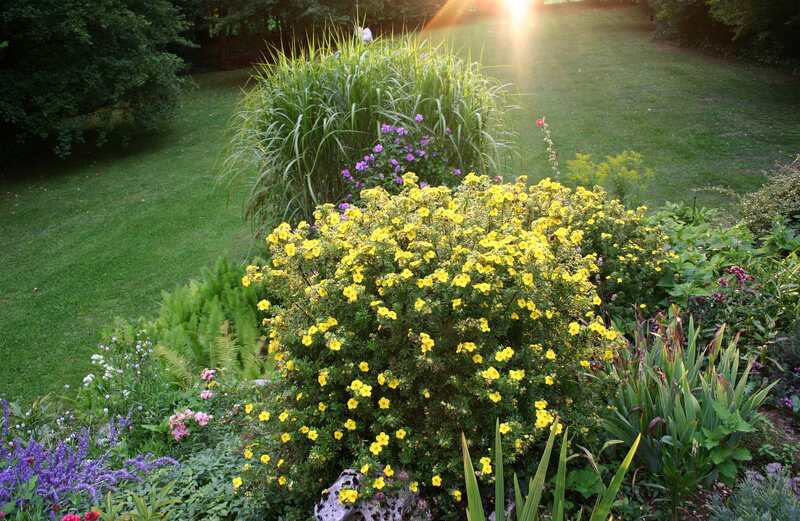 It’s fun to watch evening light as it moves around and focuses on certain plants. I can see the same effect early morning sometimes… in June the sun lights up a single rose bush before it reaches the rest of the rockery. But never for long enough for me to get my camera and capture it! Thanks Sheryl! Hope you’re having some sunny evenings still too! These are pittoresque views! A painter would have his pleasure. Oh Uta, if only I could paint! I’m not at all gifted in that way! Your ability is living with plants. Your garden is amazing! Those shots with the beautiful evening light are stunning. Thank you Andrea. I think June and September are the prettiest months for light. I really like the interesting extra views of your garden, the lighting is lovely too. Are the ferns bitter, I can’t imagine the taste. The nicest gardening surprise this year has been the gorgeous summer weather, which is a novelty for us in England! Wow those ferns look good! My garden surprises me every year, that’s why I love it! So nice to have a ‘look’ round your garden. It’s gorgeous! I was amazed they recovered, but the speed at which they grow is even more incredible! They haven’t got much higher than in the photo though, and are now starting to turn yellow as autumn gets a hold. Thanks for your comment Dana! 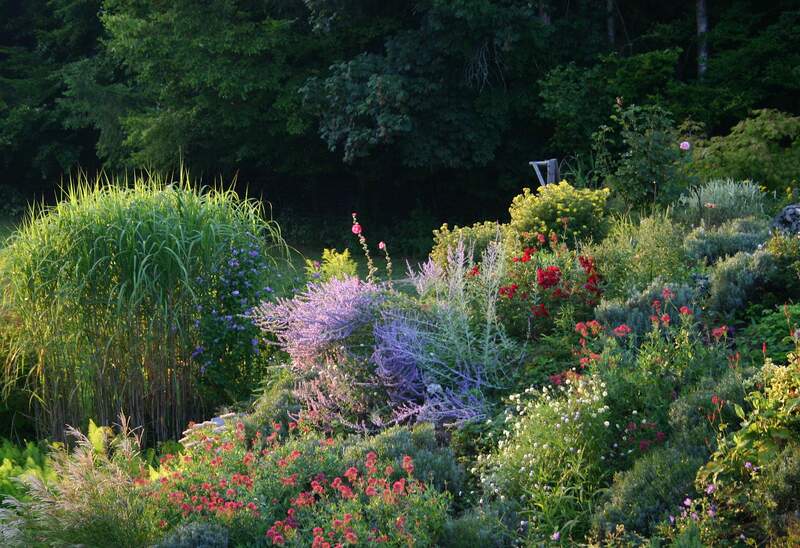 I love the light we see gently enveloping our late summer and fall gardens…your gardens are gorgeous!! Thanks Donna! The rockery has astounded me this autumn, bouncing back from the drought. The misty mornings are also pretty, but with little signs of the sun lately!